Last night as I walked by my gun closet I heard a whisper. “Take me; take me,” it said. I opened the door quickly to see which of my guns was talking. At first I didn’t see where the sound had come from. Every gun seemed to be quiet and in its case. Then I heard it again, only this time it said, “Up here, up here!” It was the 45 ACP Taurus 24/7 house gun. The one that’s there for when the bad guys come calling. There it sat on the top of a book shelf, reminding me it had been far too long since it had been to the range. So today, we did. I have more expensive pistols. I carry more expensive pistols and have no complaints with either my SIG P226 Elite or my Springfield XDm. But I sure enjoy shooting the Taurus 24/7. Maybe that’s because my first semi-automatic pistol was a 9mm Taurus 24/7. It shot fine and never gave me a bit of trouble. I only sold it to make room for this 45 Caliber version. Not long ago I bought a 40 Caliber Taurus 24/7. It was on sale at a great price and somebody, somewhere, maybe somebody in my family, is going to want a good, low-cost pistol and I’ll have just what they need. I should have brought my target home so I could post a picture. It was one ragged hole shot from 10-12 feet. I have to be honest and say that a couple of the WWB 230 grain FMJ rounds didn’t load without a litle coaxing. But with the 185 grain JHPs I keep in the gun, that’s never been a problem. The smaller caliber 24/7s have never refused to digest anything I’ve fed them. It’s just the 45 that’s a little picky with cheap hardball. As I was leaving the range I showed my target to another firearms instructor who was there with husband and wife clients. He grinned and said, “Yeah, I was just telling these folks about the Taurus 24/7.” See, don’t believe all the bad press you read on the Glock forums. 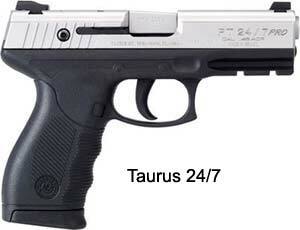 Taurus makes fine firearms. It’s kind of funny you mention Taurus, I was looking for a better fit for my concealed carry and was looking at a few guns some of my friends recommended. They were all fine fits but on the expensive side. I hadn’t thought of the Taurus but one happened to catch my eye that day. I am a big 9mm fan and it was the Taurus Millenium PT111Pro. Way better on the wallet and I have put about 500 rounds through it without a problem. I have no doubt this gun will serve me well for a very long time. Thanks for the note, Gary. The PT111 Pro is an excellent carry pistol. Previous Previous post: Get a Grip!